The Sunset Pavilion is a four-storey villa epitomizing contemporary tropical architecture and design. Bright colored areas are appointed with mostly island inspired furnishings along with first rate facilities intended for your all-out enjoyment and ease. Constructed on a hillside ascending from Nathon Beach, Sunset Pavilion affords you elegant vacation living with a beautiful, upland ambience. 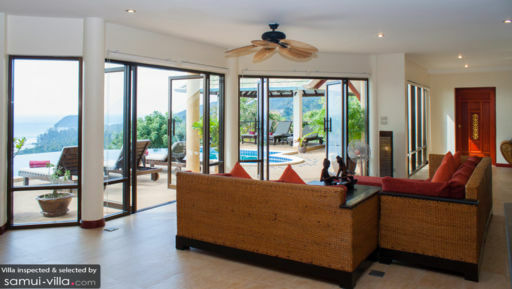 There are four bedrooms in the villa – the Blue Suite, the Red Suite, the Burgundy Suite and the Garden Suite. All these bedrooms have ensuite bathrooms as well as fabulous sea views. Although both the Red and Burgundy Suites open out to balconies with jacuzzis. Aligned to the edge of the second-floor exterior stone deck is the beckoning, 10-meter, free form infinity pool. At one end is a circular, submerged sitting area where you can recline as you look out to the Gulf Of Siam. 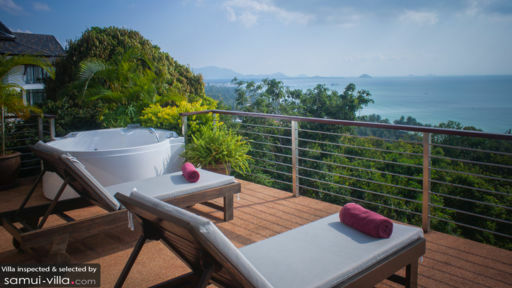 On the stone deck are pool beds where you can lie as you bathe in the sun. 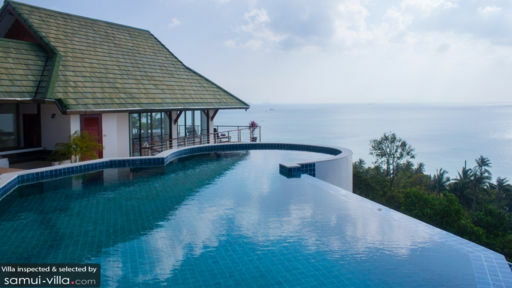 At the other end of the infinity pool is a sala with pool beds where you can simply doze off. The villa has two living areas – one is on the second floor and the other is on an upper floor. On the second floor, as well, is the dining area. Adjacent to the dinner table is a modern kitchen. The villa also has a bar and a sauna. Directed by a manager, Sunset Pavilion’s amiable staff will attend to you and assure that everything’s alright. Besides the common services like overall villa maintenance and airport transfers, more services can be made available to you. These are babysitting, private catering, laundry and spa treatments. All these, however, come with extra fees. Just a few hundred meters from the villa is the beach where you can go for a dip in its shallow waters and, at low tide, comb its sandbanks. You can also hop aboard a boat for an expedition to Angthong National Park. Or, you can choose to explore the Elephant Jungle Sanctuaries. Then, at dusk, enjoy appetizing seafood – as well as the magic hour – at the Sunset House.